This series, started in 1983, publishes studies based on the annual series of lectures given in the Michaelmas term in the Law Faculty. 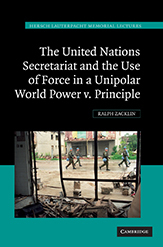 The texts in this series are based on the themes explored by the world's most distinguished scholars and practitioners in the annual lectures given in Cambridge to commemorate the unique contribution to the development of international law of Sir Hersch Lauterpacht. To purchase from CUP click here.